but if you have a question you don’t see here, just call us! How do I contact The Revelry leasing office? Please contact us by email at Mackenzie.scovill@gmail.com or devongolub@gmail.com, or call our office at 512-635-0105. You can also stop by our leasing office anytime for assistance at 3438 Summerway Drive, College Station, TX 77845. Click here for a map. When is The Revelry leasing office open? We are open Monday through Friday from 10:00 a.m. to 6:00 p.m., and Saturday from 10:00 a.m. to 3:00 p.m.
Where is The Revelry located? We are conveniently located on Rock Prairie Road West (just passed Diamond T Storage). You can google “The Revelry” and it should get you here! For your convenience rent includes lawn maintenance, use of our amenities center, and high speed internet. 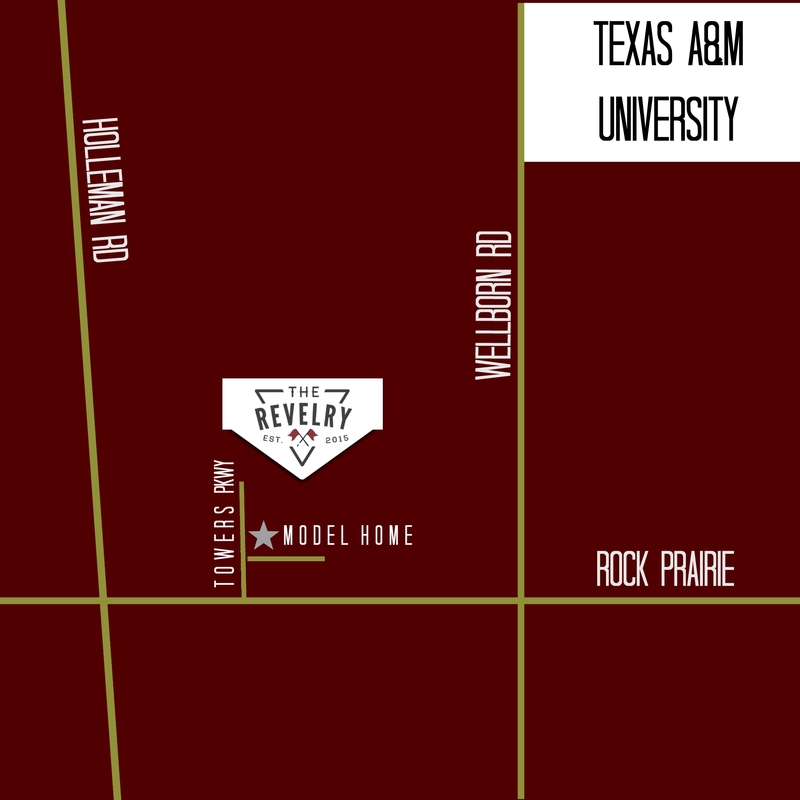 We are conveniently located just a short 2.7 miles from campus. We offer three- and four-bedroom floor plans. Visit our floor plans page to learn more. Each unit is furnished with its own washer and dryer. We only offer 12 month leases, generally running from summer to summer. You’re welcome to pay at the leasing office during business hours by check or money order, or you can pay online by clicking here. Rent is due on the 1st of each month with a grace period until the 3rd day of the month. Rent is considered late beginning on the 4th of each month. Please note that late fees will start to accrue beginning on the 4th. I’m an international student — what do I need to sign my lease? You will need your passport and I-20 form. Please call our office if you have any additional questions.